I was recently asked to review TheBullTrader.com web site, so this is a sponsored review. TheBullTrader.com is a stock charts market blog that appears to be relatively new on the internet (domain name registered in 2005) but it's already registering many visits and it is well know in the Technorati Community, where TheBullTrader is linked by 761 others blogs. Its home page has a PageRank of 5 and the site has an Alexa ranking of 259.829 at the day of this review. The site was founded by Johns Wu, currently an undergrad MCB major at UC Berkeley. With Johns, there is a young and enthusiastic staff of contributors: Brett Goldstein, Stephan Abraham (degree in Economics and IT in Citigroup), Denis Lam, Mark Wu, Keidric Wong and Steve Owen. As you can see, the site has the structure of a blog, where the newest article is on the top and all articles/news are arranged into categories easily accessible. People at TheBullTrader.com site use the well known charts offered by StockCharts.com and they have a "classical" type of approach to technical analysis in their articles (so, easy to understand even to people who are new to technical trading), and, as far as I can see, their last "hint" was really great. 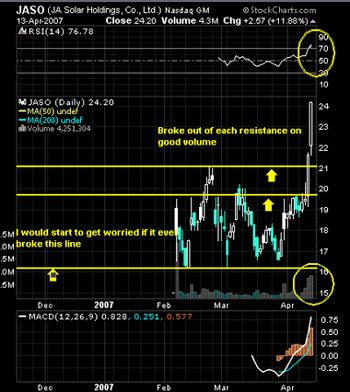 It was a nice breakout on JASO (JA Solar Holdings Co Ltd), saw on this friday morning, the 13th, that produced a nice gain (by the way, it was an Expansion BreakOut....). On the left, the analysis on their site and, on the right, the actual situation (16th apr). Sometimes, people at TheBullTrader run a "screener" and publish the results on their site under the name "Top Uptrending Stock". Even if a screener could always be useful to readers, as it reduces the reader's effort to find a "good" stock to trade, I would prefer to know what parameters they use to run this screener (at least I didn't find on their site....). So, I can suggest to visit TheBullTrader.com and, maybe, subscribe their RSS or Feedburner feed by email or ask them questions and see if they post another great suggestion as this last good "expansion breakout" (Jeff Cooper docet). Mi è stato recentemente chiesto di fare una recensione al sito TheBullTrader.com (recensione sponsorizzata). TheBullTrader.com è un blog relativo all'analisi tecnica di mercato che risulta piuttosto giovane nel panorama dei siti internet (il nome dominio è stato registrato nel 2005) ma sta già ottenendo degli ottimi risultati in termini di visite da parte degli internauti in cerca di informazioni sui mercati finanziari (per esempio in Technorati risultano ben 761 blogs che "puntano" a TheBullTrader.com). La home page del sito ha un PageRank di 5 e su Alexa viene registrata una posizione di tutto rispetto: 259.829 al momento di questa recensione. Il sito è stato fondato da Johns Wu, attualmente "undergrad MCB major" all'università di Berkley. Insieme a Johns, c'è un nutrito gruppetto di giovani ed entusiasti collaboratori: Brett Goldstein, Stephan Abraham (laureato in Economia e attualmente impiegato nell'information technology di Citigroup), Denis Lam, Mark Wu, Keidric Wong e Steve Owen. Il sito ha la struttura tipica di un blog, dove la notizia più recente viene pubblicata in alto, al primo posto, e tutti gli articoli/news vengono organizzati in categorie per esser facilmente raggiungibili. Qui sotto, sulla sinistra, il grafico tratto dal TheBullTrader.com e, sulla destra, la situazione riassuntiva ad oggi (16 apr). Saltuariamente, nel loro sito viene pubblicata (con il nome "Top Uptrending Stock") una selezione di titoli derivanti da una operazione di "screening". Sebbene uno screener possa sempre essere utile per i lettori, poiché riduce lo sforzo dell'andare a cercare i titoli in qualche modo ritenuti "sovraperformanti", io preferirei conoscerne esattamente i parametri di configurazione (ma non sono riuscito a trovarli nel loro sito). Per concludere, posso suggerire ai lettori di ArezzoTrade di visitare il sito TheBullTrader.com e, magari, di sottoscrivere il loro feed RSS in maniera da poter avere aggiornamenti immediati sui titoli da loro indicati, per poter considerarli e valutare se possano esser consoni alla propria personale operatività. In attesa che indichino un altro bell' "expansion breakout" (Jeff Cooper docet).